Iceland’s summer season is filled with festivals. So many festivals. Some take place in small and remote fishing towns. Others are spread out over larger settlements. And yet others take place in the city. The festivals, they come in all shapes and sizes—but few are as modest as Melodica Reykjavík. Melodica was established in Australia in 2007, and has since seen iterations spread through Central and Northern Europe. 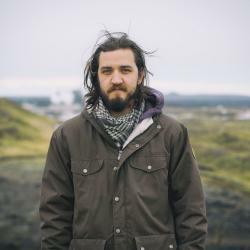 The festival came to Iceland in 2008, aided by the efforts of of local singer-songwriter Svavar Knútur (he just released a new song—check it out on his Facebook). With the 2015 Reykjavík edition about to commence, we checked in with the man who started it all, 33-year-old songwriter Pete Uhlenbruch. Cheerful and attentive, Pete relays the story of the first ever Melodica. It came to be, he says, because he wanted his songwriter friends to get to know one another and perhaps collaborate. Struck with an idea, Pete started mak- ing some phone calls—in the space of two hours he had planned a festival that would take place in three weeks time, having secured a venue, a func- tional PA system and performances from eighteen musicians. In the years since, Melodica has grown and spread far and wide, while maintaining the DIY grassroots spirit and the pay-what- you-want policy. So Pete, what sets Melodica apart from other festivals? When you have a regular concert, it’s two or three bands playing, and it goes something like this: you sound check, you play, you have a beer, and then you go home—it offers limited interactions. Larger festivals are alienating, too, be- cause you have so many people and so much going on, leaving artists with little time to hang out together and get the creative juices flowing. Melodica, on the other hand, is focused on some- thing else: it’s about bringing passion- ate artists together, offering them a chance to spend time with likeminded people, and letting their creativity infect each other. At this point, Melodica is a network of festivals spread across Europe, so artists often meet up once they’ve got- ten onto the circuit, resulting in tours being booked. Like with Poems for Jamiro from Hamburg, and Meadows Ever Bleeding from Sweden, who went on a mini-tour together before coming to Melodica Reykjavík—by the time the festival comes around, they’ll already be in the zone and know each other’s stuff, so there will be a noticeable and palpable camaraderie between them. The audience picks up on that kind of stuff, and that’s what I love most: see- ing these small choirs spontaneously pop up. Did you feel there was any extra red tape involved when starting the festival in Iceland? No, quite the opposite actually. Things are pretty much at arm’s length over here, which is rather nice. It allows Melodica to be sort of like a guerrilla festival—it’s very DIY grassroots, with no real hierarchy—just people helping each other out. All you need is a venue, and then it’s like couchsurfing, with a stage: we invite musicians to come here, and then we find them a place to crash where they get to meet each other. Is this what artists find appealing about the festival? Yeah, I think the fun thing about couchsurfing is that it allows you to drop straight into a lifestyle, where you bypass the distance between the tourist and local cultures. When you have a lo- cal hosting you, they take you to places and look after you, which chimes well with Melodica as a festival run by artists and for artists. It’s like, ”come stay at my place, and then we’ll all go out for hot dogs, and then brainstorm some ideas together”—a lot of spontaneous collaboration tends to happen this way between lo- cal and international artists. They’re all hanging out, and connecting, and then they’ll have an idea for a song, or need a harmony for an existing one, and wind up performing it together at the festival. We try to give artists more than one opportunity to play, especially if they’re from overseas, so if other artists see someone they want to join forces with, they can. And how do you keep it financially sustainable with the pay-what-you-want admission? [chuckles] Well, we encourage people to contribute, but we want it to be accessible to individuals of all income streams, because we like the idea of a communitarian open philosophy. When we’re in a position of having left- over money, it all goes to the international artists, to pay for their trips. We make the participating artists aware of the fact that we might not be able to pay for all of their travels, but they get the chance to experience meaningful face- to-face networking, which is important to them. This year we’ve got the curators from Hamburg and Cologne in attendance, who also run other festivals. There are thus several opportunities for artists to make important connections for the future. With the festival, we do our best to break even—we don’t have much in terms of financial support, but it some- how always works. The modus operan- di is just to cover costs. It’s not always easy, but we don’t want to make it a ticketed event. Has the festival always been acoustic exclusive? No, not at all, but he’s a passionate song- writer, and I guess we want to encour- age those kinds of people to join us. We like having the flexibility of being able to invite who we want to! What is it about the festival that makes you keep coming back to it? There’s this sense of effortless joy that comes with it. There’s something about community that’s really powerful, that I wasn’t aware of when I was younger. You just get these little magic pockets where you feel like time is suspended, where you have the full attention of a hundred people at once. I’m very interested in those kinds of environments, but then again I’m a hippie at heart, so there’s that.